Visual Studio Code>Programming Languages>Gradle Language SupportNew to Visual Studio Code? Get it now. 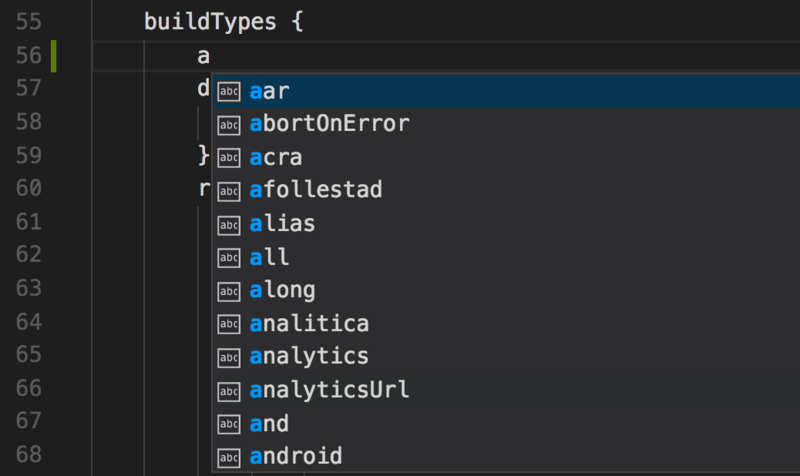 An extension to provide Gradle language support for Visual Studio Code, including advanced functionalities like Syntax Highlighting, Keyword Auto-completion Proposals and Duplication Validation. The extension observes all .gradle documents and uses the server to provide validation and auto-completion proposals (IntelliSense). The code for the extension is in the client folder, which uses the vscode-languageclient node module to launch the language server. The language server is located in the server folder. The tests are located in the test folder. 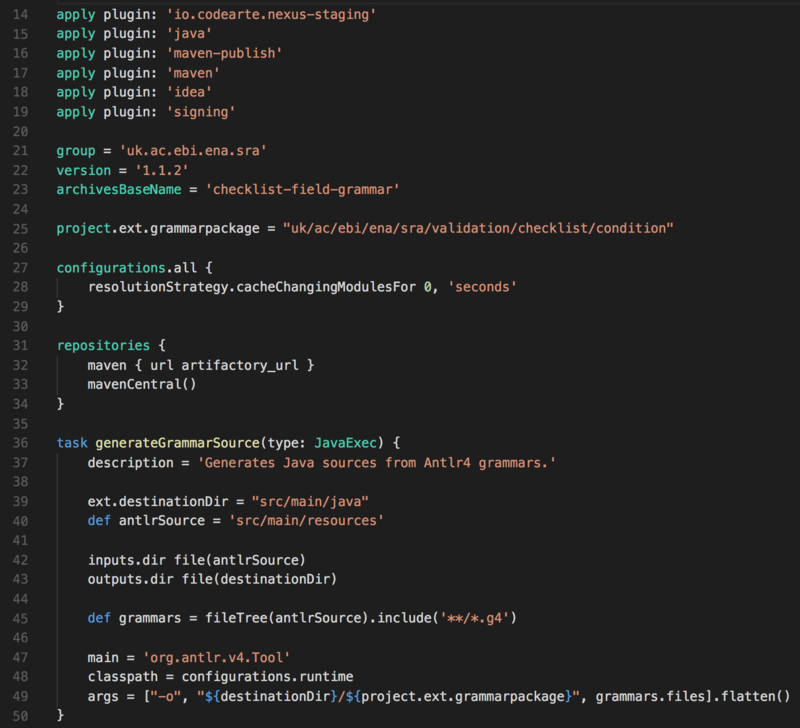 The extension converts the sublime-gradle's TextMate grammar configuration for Gradle language. Particularly, after the apply method, propose the parameters for plugin application. At the start of a parameter, propose Task Container's constructor parameters. 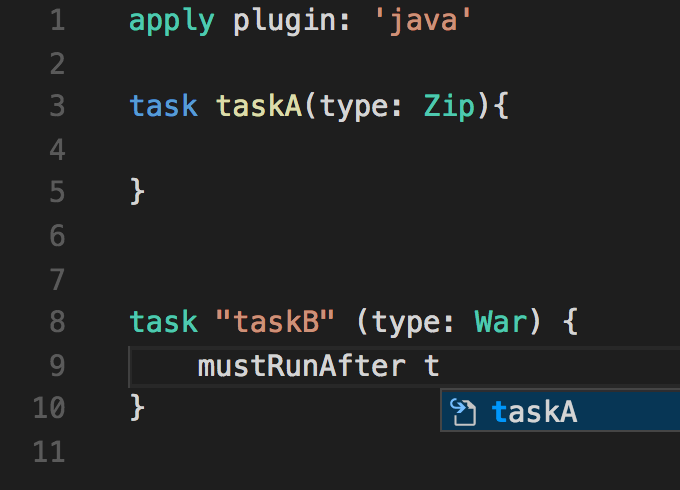 Particularly, after the type parameter, propose Task's default types. Particularly, after the dependsOn parameter, propose other Tasks names. Particularly, after the TaskDependency methods (i.e. dependsOn, finalizedBy, mustRunAfter and shouldRunAfter), propose other Tasks names. Elsewhere, propose the Delegate Object together with its properties and methods. After an entity's dot inside a line with existing code, propose the properties and methods of this entity. On the root level of the build script, propose the properties and methods of the current script's Delegate Object. Particularly, in a TaskContainer, analyze the task's type and propose the properties and methods according to this type. In a script block of NamedDomainObjectContainer, such as BuildTypes, ProductFlavors, SigningConfigs and AndroidSourceSets, DO NOT override default keywords and let the user decide the name for each item. In a configure closure of an item within a NamedDomainObjectContainer, propose the properties and methods of this container's element type. In a script block of a general property or method, propose the properties and methods of this script block. The extension automatically validates the script under editing and warns the user about duplicated script blocks. Pull the repo and cd to the root directory. Run npm install to initialize the extension and the server. Run npm run compile in the terminal to compile the extension and the server. Open the root folder in Visual Studio Code, then set the Preferences -> Color Theme to Dark+ (default dark). In the Debug viewlet, run Launch Client from drop-down menu (or press F5) to launch the extension and attach to the extension. Create and open a file build.gradle and type 'app' into it. You should see keywords proposed including 'apply'. In the Debug viewlet, run Attach to Server launch config and set breakpoints in the client or the server. In the Debug viewlet, run Launch Unit Tests from drop-down menu to run the unit tests. Updated the display name. Fixed a bug that fails to parse task constructor's name without parameters. Added unit tests. Fixed some minor bugs. Added Task Dependency proposals. Fixed some bugs in Task parser. Republished after installing node modules and compiling server source codes.